In the past, I’ve always had bulky, rustic, outdoorsy laptop backpacks. This time, I wanted something a little more feminine and professional looking. Initially, I thought I was going to get a cross-body courier-type laptop bag — because you’ve got to admit, it’s bare bones practical. But I decided it was a bit too casual for I wanted. BumBakPak Hamptons Hybrid Laptop Bag – because I’m a sucker for lots of pockets and a bag with multiple purposes. Classic Messenger Bag – because it’s so basic and practical, but provides little protection. Swiss Gear By Wenger Computer Messenger Bag – because I’ve used their bags before & they’re rock solid. Timberland Laptop Messenger Bag – because it’s another multi-purpose bag with nifty pockets that I love. After a lot of research, I finally found a handful of laptop handbags that clearly looked more like purses than computer bags. 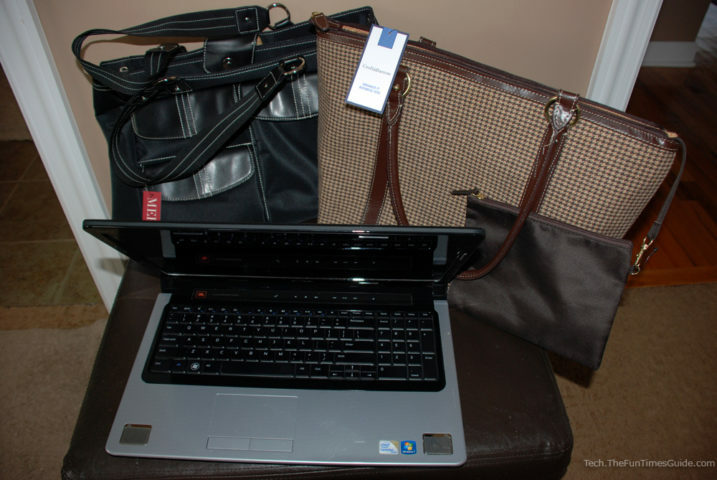 In the end, I decided to get a relatively inexpensive laptop handbag for now. In fact, they were so inexpensive, that I got 2 different styles for myself: (1) Merona Casual Work Tote and (2) Croft & Barrow Organizer Tote. 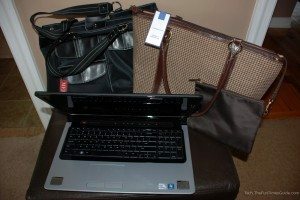 My mom also got a new 17-inch laptop recently, so I got her this one: Croft and Barrow Classic Triston Tote. I’m currently saving up for this one: the Claire Chase Ladies Computer Handbag. At just over $200, it’s more expensive than any other bag or piece of clothing I’ve ever owned. But it seems like exactly the type of laptop purse I’ve been looking for! I recently purchased a Chromebook. I love it because it’s super lightweight and easy to take on our motorcycle trips, airplanes, and in a travel bag. For basic protection, and to make it easier to carry, I got this neoprene-like Case Logic 12.1″ Laptop Sleeve. It’s one of the few that has a place to store the AC power cord. Plus, I like that both the laptop compartment and the smaller accessory pocket have zippers, so everything stays securely inside. Yes, that’s another feature that is hard to find on bags that fit the Chromebook (…on bags that aren’t thick and bulky, that is). It also has 2 soft & lightweight handles that don’t get in the way at all. That’s a handy feature when you just want to grab ‘n go with your Chromebook. In addition, I purchased a Booq Viper Sleeve. It’s a harder (softly molded) Chromebook cover that simply gives extra protection in the event that someone accidentally leans on top of the Chromebook itself. Plus, it provides minor protection against bangs and drops while traveling. This video gives you a quick look at the Viper Sleeve. So, first I slip the Chromebook into the Viper Sleeve (it’s a very snug fit), and then I slip that into the Case Logic Sleeve (also a snug fit) and zip it all shut. Together, these 2 Chromebook covers are a great option for protecting and transporting a Chromebook. But I’ll be honest, usually hubby uses the Viper Sleeve alone as a cover for his Chromebook. And I usually use the Case Logic Laptop Sleeve alone for mine. Both have just enough padding to protect from minor bumps when we’re traveling.